Why search for a pen when you can take accurate notes at the speed of sound? The Philips Digital Voice Tracer 7655 is a digital verbal notepad for innovators who think on their feet. Just start talking and the Digital Voice Tracer captures your every word. Voice activation enables easy, hands-free note taking. The 7655 features up to 33 hours of talk time and an end-of-memory warning tone. With space for 99 files in 4 folders, you can capture scores of ideas that can then be downloaded to your PC. Dictation machine features hands-free dictation with voice-activated recording or single-handed dictation with four-position switch. Index tones for end-of-letter priority and special instruction. Microphone sensitivity option for conference or close-up recording. Avoid dictation loss with no cassette lock and audible end-of-tape warning. Telephone recording capabilities with optional equipment. All information at a glance with Visual Workflow Display. Transcription features hands-free operation with foot control, optimum playback from volume/tone/speed controls, pause without missing a word with auto backspace play, quick access to the start of the next dictation with search forward/skip, and display all index information with auto rewind scan. 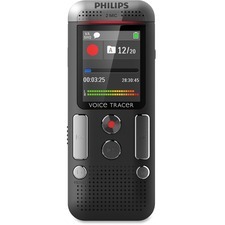 Philips Voice Tracer Audio Recorder (DVT2510/00) - 8 GBmicroSD Supported - 1.8" LCD - MP3, WAV - Headphone - 2280 HourspeaceRecording Time - Portable The VoiceTracer 2510 is perfect for capturing notes, ideas and thoughts on the go. Thanks to its two microphones, your recordings are captured in outstanding stereo quality. The large color display makes recording quick and easy. 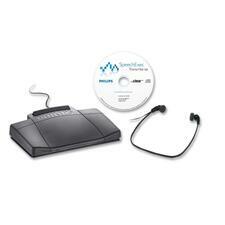 Transcription set offers PC-based digital transcription. The SpeechExec Transcription Kit 7177 is a digital transcription system specifically designed to make transcription easy and intuitive. Visual job overview allows more efficient organization and planning of workloads. Visual workflow management facilitates priority documents to be transcribed in order of your preference. Access job information during transcription, such as file/job length, author/file name, keywords, priority status and position within file. Job status indicator shows if a dictation is pending, in progress or completed. Automatic transfer of dictation files via network turns your PC into a transcriber. Other features include speed, tone, volume control along with auto backspace and search, skip forward feature. 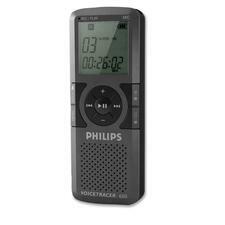 Package includes: SpeechExec Transcribe software, USB foot control, 0334 headset, smart key and user manual. Turn your voice into text with first-class recordings and speech recognition. Record documents and notes on the move in high quality. Back at your desk, simply connect the recorder to your computer, transfer your files and let the included Dragon Naturally Speaking software automatically turn your speech into text. Two built-in stereo microphones deliver clear voice recordings and reduce background noise, even in loud environments. High-quality recording is essential for clear playback and accurate speech recognition results. MP3 recording allows easy file sharing. Voice-activation allows hands-free recording. Automatically transcribe your dictation files. Large color display offers sharp images, supports eight languages and is optimized for easy, intuitive operation. 4GB internal memory allows up to 44 days of recording. MicroSD memory card slot offers virtually unlimited recording. Specialist analog transcription machine is geared towards simplicity. Large-digit LCD shows tape information at a glance, while user-friendly controls allow individual documents to be accessed at the touch of a button. Three-function foot control provides hands-free operation of play, fast forward and rewind. Recorder offers a fast return to the beginning of the tape with auto rewind, quick access to the start of the next job with search forward and skip functions, and fast access to any part of the tape with turbo wind. LCD tape counter displays information stored on your mini cassette. Headphones keep playback clear and confidential. 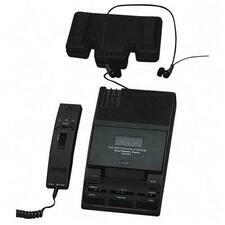 Recorder includes headset, foot pedal for hands-free transcription, and power supply. Acoustic frequency response is 200 to 6,000 Hz. 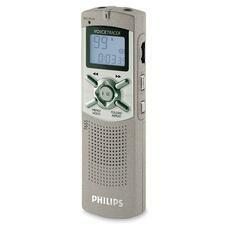 ICD-P620 512MB Digital Voice Recorder easily record important lectures, meetings and personal memos with the Digital Voice Recorder ICD-P620. Digital VOR (Voice Operated Recording) stops the recording during silent pauses and then begins recording again without missing a single syllable because of the digital buffer. Three recording modes include Long Play (261 hours, 45 minutes), Standard Play (159 hours, 20 minutes) and High Quality (59 hours, 45 minutes). When finished recording, connect to a PC via USB and save your files for later reference. LCD screen easily shows the number of messages recorded, recording length, date, time and battery power remaining. 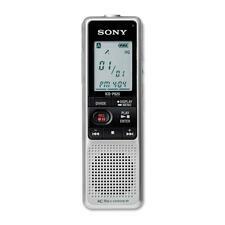 Features 512 built-in flash memory, four message folders, single function buttons for simplicity selectable microphone sensitivity (hi/lo) and date/time stamp on all recordings. 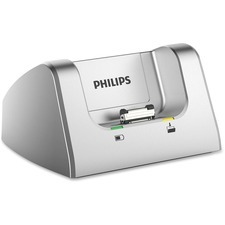 USB Docking Station is designed for Philips Pocket Memo Dictation Recorder. Simply dock your Digital Pocket Memo Recorder to this compact USB Docking Station, and you can quickly and easily transfer all your dictations to your computer. The docking station also quickly charges the batteries in your Digital Pocket Memo Recorder, even when it is not switched on, so you are always ready to go. 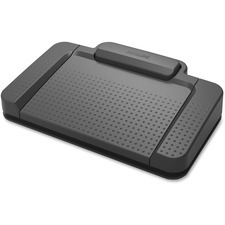 Combined with the optional foot pedal (sold separately), you can record hands-free and transcribe even without a computer.